There’s nothing like quality time with your closest friends, family, peers. Especially when around loud racecars, food, and drinks on a relaxing Sunday. Nothing will ever beat that. EVER. And that statement proved true on one random sunday with our friends from Freedom Motorsportz & Velocity Stars……. For anyone who is based here in the northeast or anywhere were there is a strong possibility of a very brutal winter season, knows how it feels when the snow finally starts to clear, and warm weather starts to slowly but surely come back to your part of the world. Especially us car enthusiasts. Winter season means “off season”, and for the most part automotive based fun shuts down entirely. This past winter was no different. It was brutally cold, there were multiple snow storms weekly, and it just felt uncharacteristic long for some odd reason. We were all feeling pretty restless. Some of us almost were driven to the point of picking up, leaving everything behind, and relocating to somewhere with a warmer climate. Fortunately though we decided to stay around. And I’m glad we did because we were defintiely rewarded for it. One of our team driver’s, Anthony Failia of Velocity Stars, has been fine tuning his LS3 S13 drift build and was finally ready to have car legitimately tuned so he could thrash on it for the whole 2015 season. 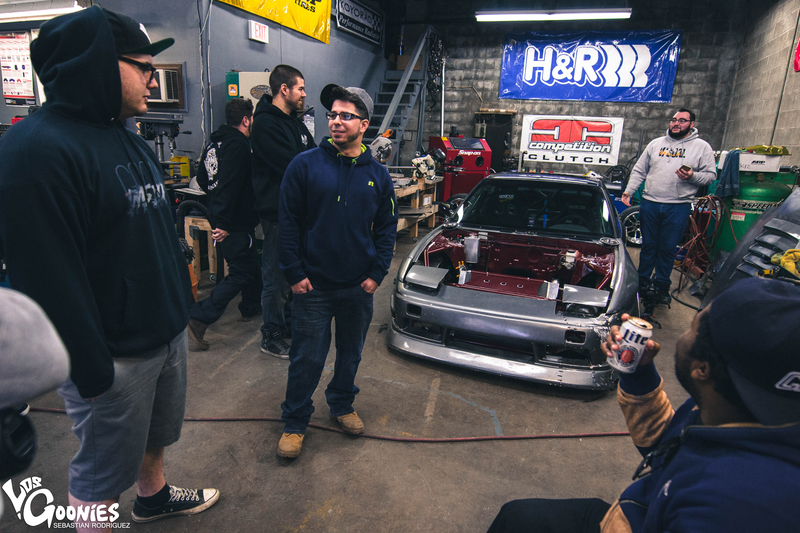 Not only that, we also got word that an old friend of some of the guys just recently completed his TRA KYOTO Rocket Bunny S15 so the whole gang decided it was time to pay our friends in Pennsylvania a visit. 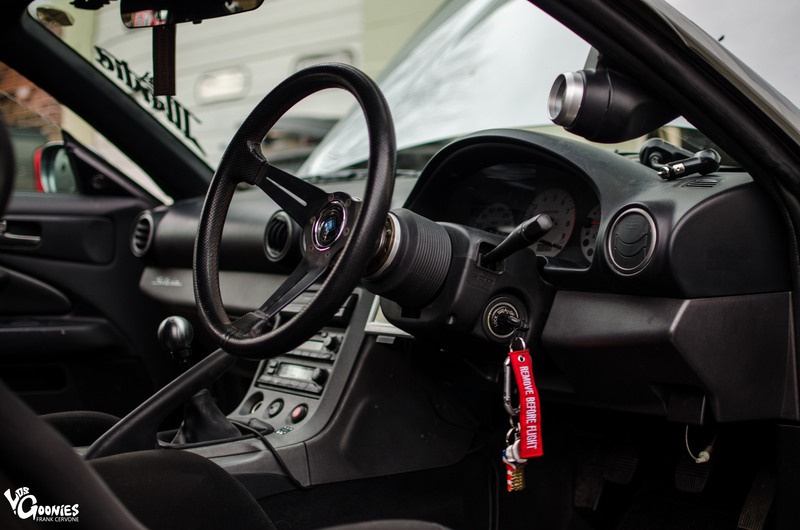 With our spirits reinvigored and our cameras charged, we all headed down to pay our friends at Freedom Motorsportz a visit to check out their great facility before heading to the shop that was tuning Anthony’s LS13. The drive was not long at all, maybe a little over about an hour or so. But when we all arrived our jaws had to be picked up off the floor. There it was sitting in all of its glory. 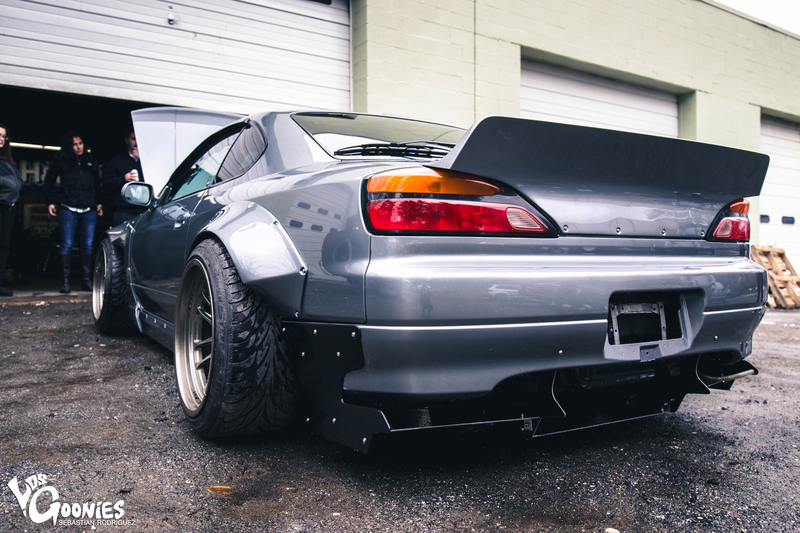 The very first Rocket Bunny S15 residing here in the East Coast. 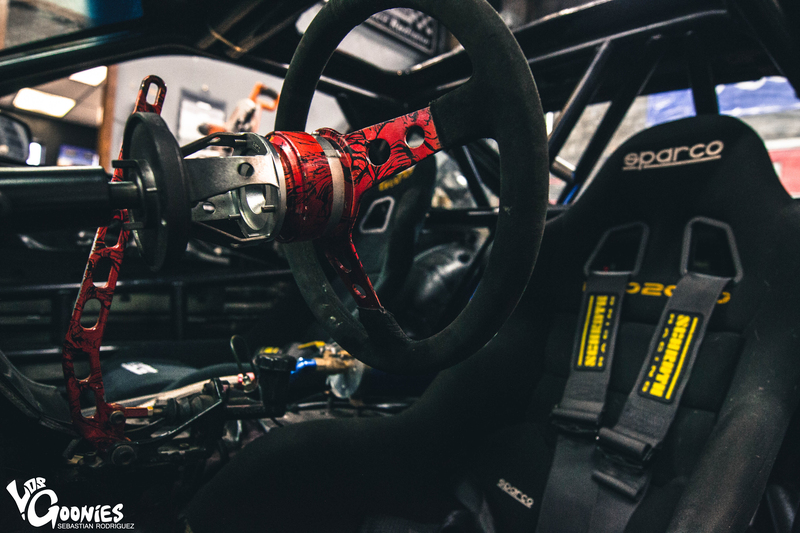 The first one belonging to drifting veteran and legend, Kenji Yamanaka (remember the dark blue Rotora S13.5 that competed in Formula D back in the days? Yes it’s that guy ;D). 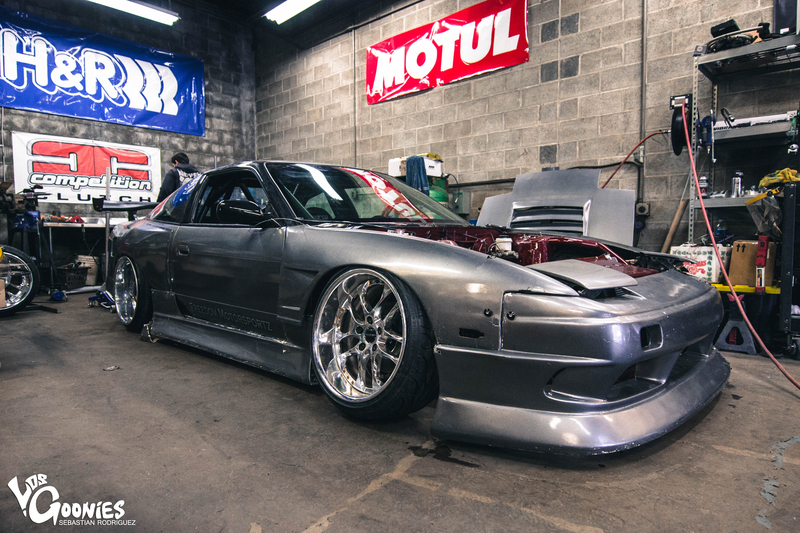 His iteration was sanctioned by Rocket Bunny and it debuted at SEMA in Las Vegas. So as far as we are concerned, this is the very first street registered, privately owned one on this side of the planet. I got to say its pretty breath taking to look at. Seriously. We all gazed at it for at least a half hour before anyone really started taking photos of it. 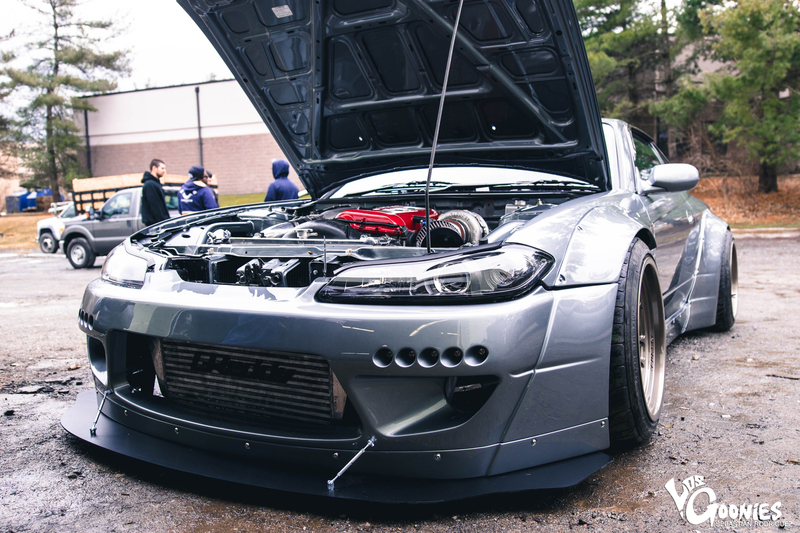 We said our pleasantries, and I met the crazy personality that is Tony Martin, the owner of this beautiful S15 and 1/2 the owners of Freedom Motorsportz. Personally, I’m not the biggest fan of Rocket Bunny builds mainly because most people execute them wrong and get too fancy with terrible wheel fitment and stances that really have nothing to with the vibe Tra Kyoto designs their aero for. But what Tony has done with his car is something different. For one the kit really actually flows with the car. 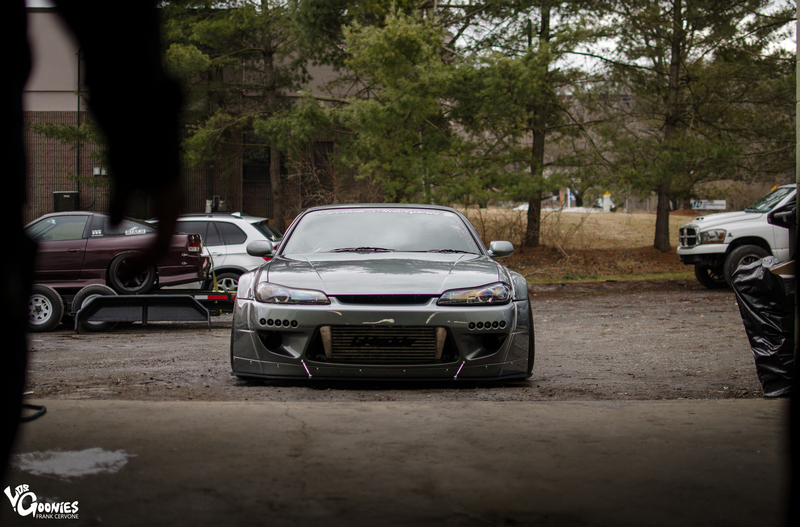 Its rounded yet sharp flares really works with the sharp lines of the S15. It definitely accentuates yet, bulks the car up in ways thats hard to describe. But I literally can tell you, no picture will ever truly do it justice. You have to see this thing person and feel the presence this thing gives off. This thing literally feels like a special moment in time. It truly defines the era of cars in this moment yet, its a great mix of 90s Nascar, Euro DTM, and Japanese shakotan culture….all rolled up into one killer package. The car is not all about asthetics though. 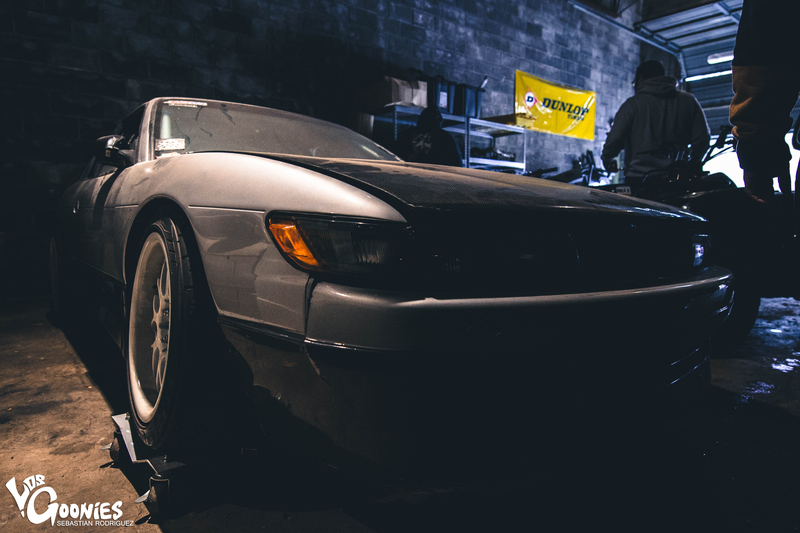 The car has a mean SR20 build under the hood too……We dont want give away too much though…..We are going to save it for the full in depth feature we have been cooking up. You will have to wait on that. On with the rest story……. Not only did we have that S15 as eye candy, but the shop workers as well as two new members of our drift team, Rich Whiteman and Eric Beck, had their personal cars on display for us to gaze at as well. This shop builds extremely stylish cars people. 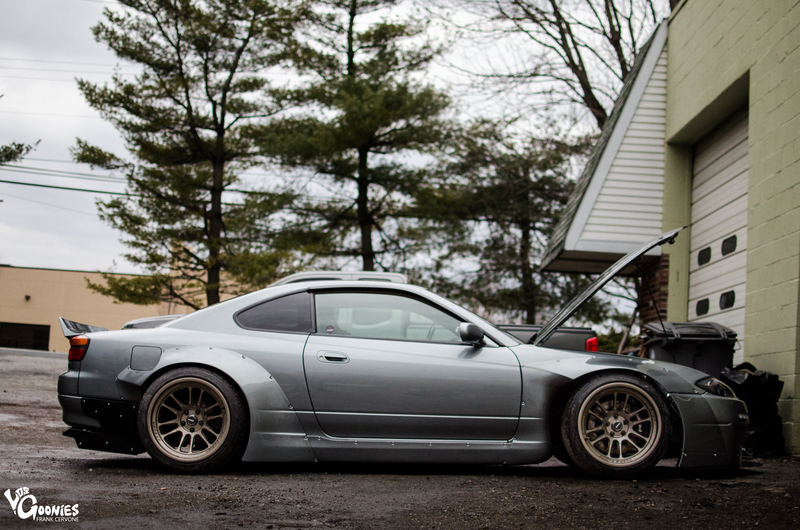 Eric Beck’s FC3S is FAR from done, but man is it coming along nicely. As you can see there is a whole lot of custom fabrication done by Eric. 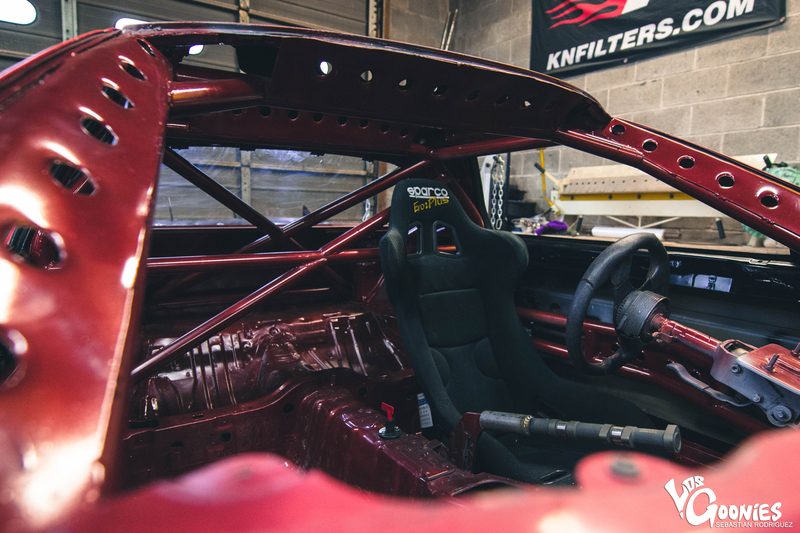 From the cage work, to the crazy amount of gussets and clean welds….this car has the fabrication and execution to match. 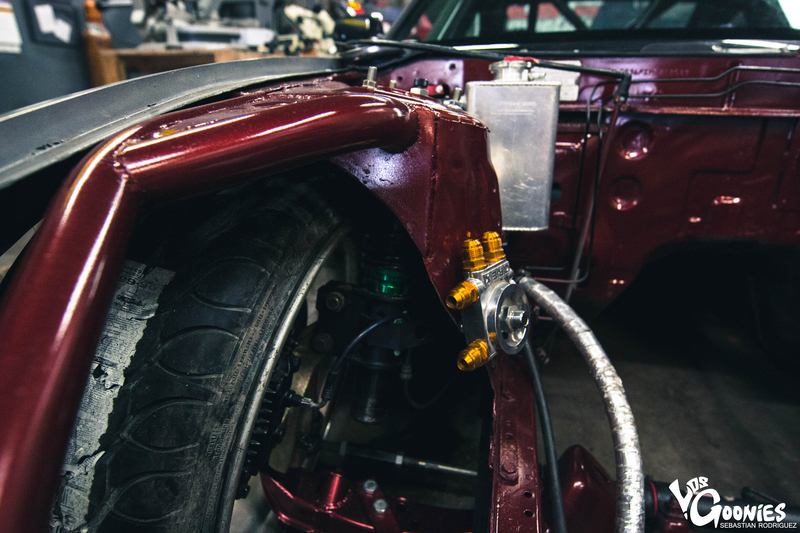 Not only that it’s got a truck conversion (the rear hatch is removed and will be replaced with a custom fabricated cover), a Tomei RB25 cam as a handbrake handle (LOL), a wing made of machetes from harbour freight…..and it will be LS’d powered. As you can see, the car is rolling on Weds Kranze Ceberus wheels and while the aero was not on the car at the time these photos were shot, we promise its going to look as good as this thing is sounding. This car represents Eric and his crazy mind entirely too well. Some bonkers stuff going on with this one. 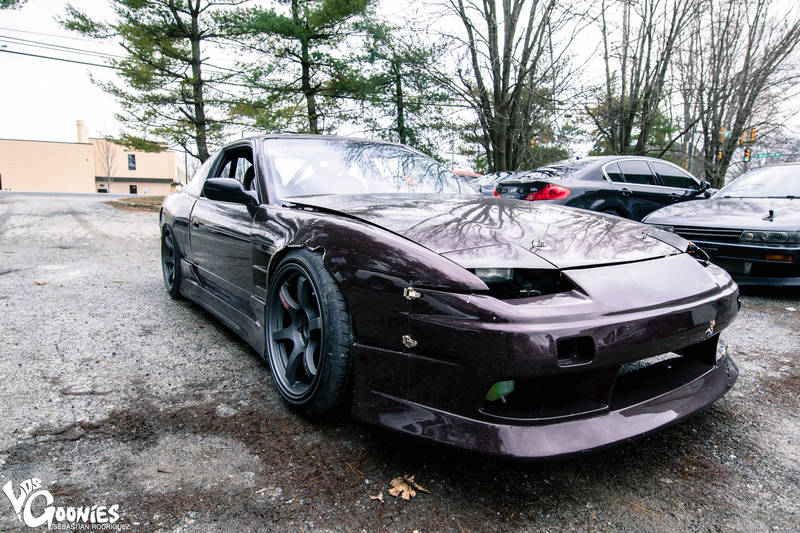 Rich Whiteman’s S13 is a little more classy exterior wise. Outside the car is an ode to Japan’s style gods from the “Golden Era” of drifting back in the early 2000s. BN Sports Type III style kit, SSR Minervas up front, Weds Kranze Bazreia’s in the rear, and a BCL “Cupcake” wing really work well together adding more to the extremely aggressive ride height on the car. The car is slammed, running around -10 of front camber alone. 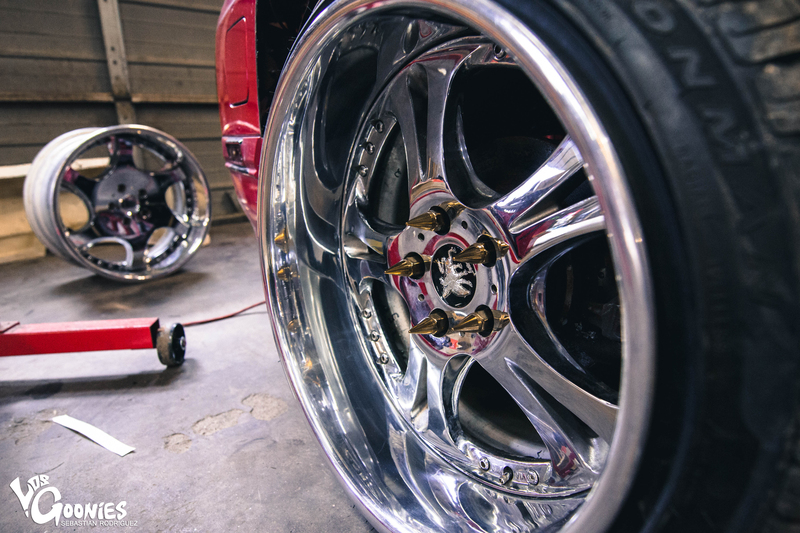 Wheels turned lock to lock, they dont rub on the wide front fenders whatsoever. The interior is straight up business though. Caged, Sparco buckets, gutted interior. This car is meant to be stylish and functional at the same time. A feat many are not capable of pulling off. The icing on the cake will be when the built LS2 motor gets put in and the car goes sideways. The internet will surely melt from the hot style the car produces. 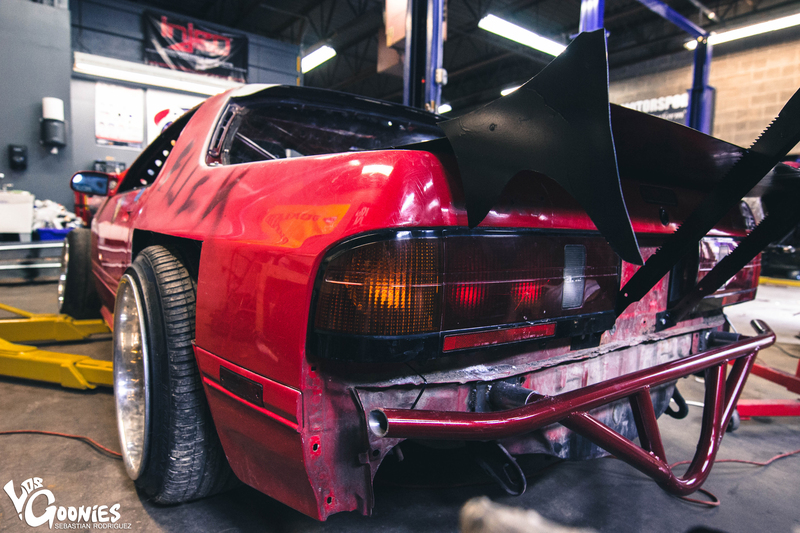 After a few hours of hanging out and sipping a few brews, it was time to head over to the shop that was going to tune Anthony’s S13. 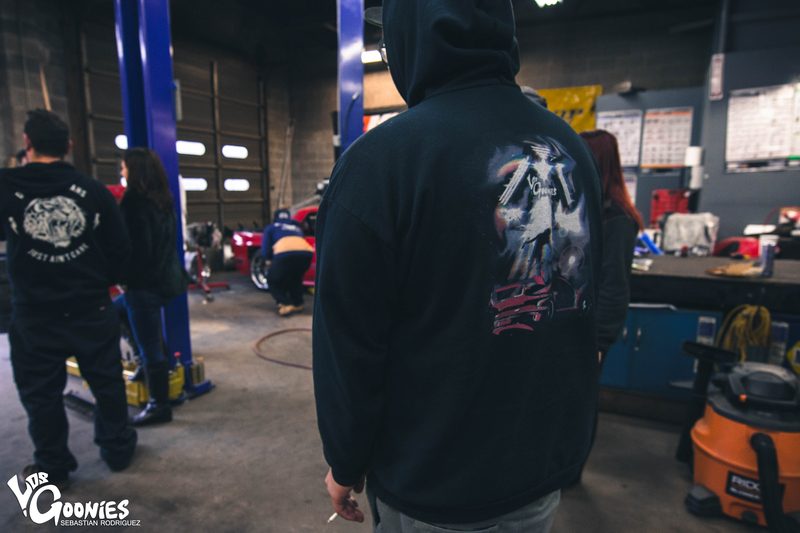 As we were getting ready to move to the next location, Tony M. pulls the Rocket Bunny S15 in the shop, and just decides to do a shop burnout…..it was unplanned, and we were barely even ready for it. Fortunately, most of us were just shooting random photos and video, and we were fortunately able to catch the moment on film. Everyone was shocked and surprised but it was one of the funniest moments of the day. I’m estactic that we caught it. That’s Tony Martin in a nutshell ladies and gentlemen…..He’s random and he does things in the spur of the moment haha. 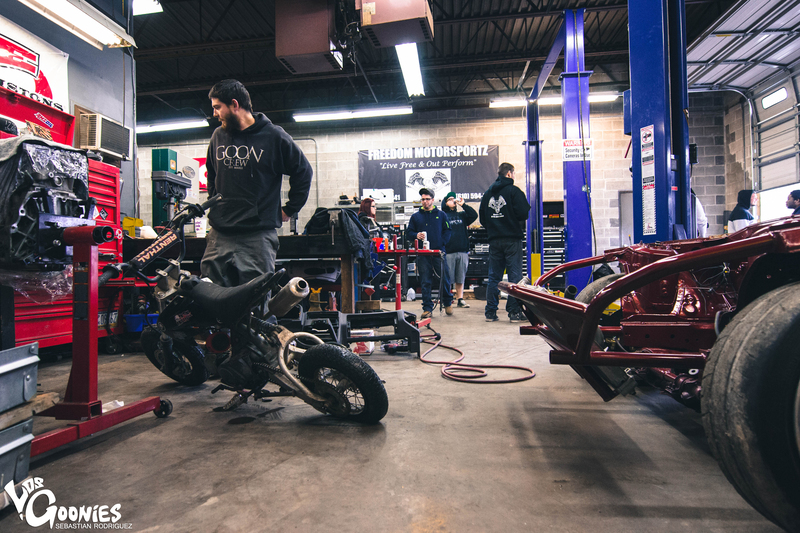 After that epic shop session, the entire group of us including the Freedom Motorsportz gang headed down to Complete Street Performance to watch Anthony Failia get his car tuned. Complete Street Performance specializes in building GM performance motors and the shop had so many great LSx powered vehicles scattered throughout its grounds, it was over whelming. The shop was only a short drive up the road, and when we got there, the tuner Andrew Zurnick got to work before the car was even pulled off the trailer. Andrew was all business, which is very commendable considering it was Sunday. He was definitely taken back considering their was over 10 of us attending, which is understandable. Our apologizes brother, we were just happy to be there man! The tuner handled the pressure well and long story short, we gave him his space, and after countless pulls and a couple of hours, the tuner up the rev limit to 7000rpm and the car made 465whp. Now in a chassis that weighs around 2200lbs, this thing is a rocketship. The car screams! So of course with all the kinks worked out, Anthony headed out to do some “tests on a closed road in Mexico”. The car looked and felt solid from the looks of it. Of course the giant smile on his face also said the whole story as well. He couldnt have been happier. So with his car worked out, we headed back from Mexico, back to Freedom Motorsportz for some last mintue chats and snaps. We said our goodbyes, packed everything up and made the trek home. All in all, it was a solid day. Exactly what the doctor ordered. We got to see some badass rides, hang out with old friends, make new ones, and just really enjoy the day entirely. Whats better than that??? Its amazing what some good times with good people can do for your spirits, but it really uplifts you when it counts. If this is any indication on how this 2015 season will go, I’m all for it. We all have so much to offer you guys I’m just happy that we have so many people along for the ride. Stay tuned, because its definitely going to be EPIC. Until then, thank you for checking out this post. We will definitely be doing more lifestyle posts like this, as well as bringing more events, more clothing, and quality features of some of the best cars on the planet. Until next time folks, enjoy. We here at LosGoonies.com have to thank Tony Martin and Paula Bellwoar for opening up their shop to us as well as giving us the time to showcase the work their shop has to offer. Thank you to Eric Beck and Rich Whiteman for being rad dudes. Thank you Anthony Failia, Deonna Rose, and Angelo Melchiorri of Velocity Stars for being rad. Also thank you to Kenny Cano, Frank Cervone, Sebastian Rodriguez and Mason Campbell for EXCELLENT film work. You guys are awesome. Thank you for reading. Photos by Sebastian Rodriguez (@srodriguez92) and Frank Cervone (@frankcervone).